Ams’ Got Talent (AGT) is an annual competition of Hanoi - Amsterdam High School for the Gifted held by the 11th graders of English 1 in order to discover and cultivate Amsers’ talents. After 10 years with tremendous success, Ams’ Got Talent Season 11 (AGT) has come back and will promisingly bring about even more surpise and excitement. On the upcoming 28th and 31st October, the preliminary audition will officially take place at the 700 Hall, and now, let’s go through some of the main points of the competition. Every year, when October comes, Amsers once again get excited about Ams’ Got Talent (AGT) - a talent scout programme launched and developed by 11 English 1. This is not only a familiar event, attached to the name of Hanoi - Amsterdam High School for the Gifted, but also an occasion for the Amsers to shine and show their talents in the spotlight. Especially, after 10 seasons, the coverage of AGT is getting more widespread, attracting a great number of audience as well as press, television, which makes the participation in the programme seem to get even more interesting. This year, with a whole new theme: Novaturient (meaning: Embark on a new journey), the Organization Board hopes that AGT will be an opportunity for Amsers to indulge their passion. With the meaning of beginning, setting out to explore new territories, AGT will be a milestone for you to courageously set off, pursue your ambition and unearth your potential. As the previous seasons, the programme will proceed through 3 stages: the preliminary audition (on 28th and 31st October 2018 at the 700 Hall), the Finale (expected on 28 November 2018) and the most remarkable stage: the Awarding Ceremony, or also known as the Prom Night (usually held between the end of January and the beginning of February). The Finale is a precious and cherished occasion for each Amser. It is not simply the time when the names of the Winner and the Runner-Ups of AGT are called out, but also an occasion for the Amsers to unwind after a stressful semester, to show off their styles and engage in the exciting and touching dances in their elegant, gorgeous outfits. In this year’s audition, the contestants will be judged by a very talented and professional examining body:singer Bao Tram (Top 3 Vietnam Idol 2012), dancer Duy Anh (First Runner-up Overdose 2014), teacher Nguyen Thanh Huyen, artist Vu Thanh Loc (writing “Me and you”, ”The story”,...) and screenwriter Dang Dieu Huong (screenwriter of “Quynh Bup be”, “Cau vong tinh yeu”,...). With the presence of such well-known judges, the audition of AGT on the upcoming 28th and 31st promises to be a dramatic and interesting competition. 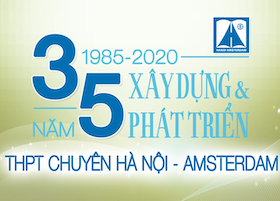 Being an annual mark, AGT is one of the most expected event in the year of Hanoi - Amsterdam High School for the Gifted’s students. With the theme Novaturient, the Amsers will have the chance to discover, determine their own potential and grow in their own area. We wish you the contestants in the audition will shine your heart out. However the results will be, we hope the contestants will always bear in mind the most beautiful memories about AGT.